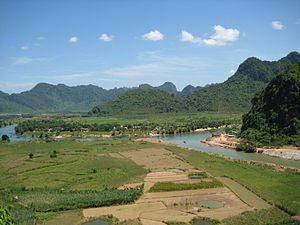 The Phong Nha-Ke Bang National Park, inscribed on the World Heritage List in 2003, covered 85,754 hectares. With this extension, the site covers a total surface area of 126,236 hectares (a 46 % increase) and shares a boundary with the Hin Namno Nature Reserve in the Peoples Democratic Republic of Laos. The Park's landscape is formed by limestone plateaux and tropical forests. It features great geological diversity and offers spectacular phenomena, including a large number of caves and underground rivers. The site harbours a high level of biodiversity and many endemic species. The extension ensures a more coherent ecosystem while providing additional protection to the catchment areas that are of vital importance for the integrity of limestone landscapes. This article uses material from UNESCO World Heritage List article "Phong Nha-Ke Bang National Park", which is released under the Creative Commons Attribution-Share-Alike 3.0 IGO License.